A year ago when I reviewed Destiny, I felt that the game wasn't completely developed, that it had a little ways to go to fulfill its potential. The Taken King realizes a lot of that potential. It's the game that Destiny should have been at launch. Before I dive into the heart of the review, though, I'd like to come clean and admit that I haven't played a lot of Destiny since the game's release. The problems with the game that I noted in my original review caused me to lose interest with it and move on to other games that I found more compelling to play. As such, I can't intelligently comment on the nuances of some of the incremental changes and won't try to do so. I know that the game did strike a chord with a number of gamers who have put hundreds of hours into the game since its launch, and if you're one of those gamers then I won't be able to tell you about all of the subtle ways that your life in Destiny will change with the release of game patch 2.0 and The Taken King. That's a discussion reserved for those who have spent as much time in the game as you have. Still, you may want to read on if you're interested in how others view the changes to the game that you love, and how those changes may bring former players back into the fold or recruit new ones to join. The player base is the lifeblood of a game like Destiny, so I imagine that you would take a keen interest in whether or not it has the potential to expand and bring in new gamers. On the other hand, if you're like me and played Destiny when it was released, and found that you wanted to like the game more than it would let you, then this review will be more meaningful to you. I recommend that you give the game another try with The Taken King, and hopefully will be able to explain to you why you should return to it. If you're new to Destiny, now's a good time to give the game a try, because it has evolved to the point where it is much closer to realizing its potential as the game Bungie set out to make in the first place. I won't rehash the basics of the game, though, so if you don't know your Titan from your Warlock I will refer you to my original review of the game. If you're contemplating a return to Destiny, or even just starting out, the first thing that probably comes to mind is character level, namely will you have to grind your way through the original game (and its two expansions, which are included with The Taken King) before you can even begin to experience the new content. Well, the short answer to that question is 'no'. Every account will be given access to a single special consumable called the Spark of Light, which when applied to a character it will instantly bring that character up to level 25 and outfit the character with blue (rare) level weapons and gear so that you can jump right into The Taken King's story. If you're a returning player, then you can boost any one of your existing characters right away. New players will have to play through the game's initial level first since it serves as a game tutorial, but after that can use the boost once they make their first trip to The Tower. In this case it's probably a good idea to give each of the three classes a little test drive before committing your boost to one of them. And for existing players, it's a great way to get a high level alt right off the bat without having to build one up from scratch. The Taken King's story mode is almost a night and day improvement over that in Destiny. Continuity, narrative, mission design and variety, ... everything is markedly better than the story-based gameplay in the original game. In the original release, the story mission levels outpaced your character's levels, leaving you unable to progress through the story without taking breaks to grind in between. Sure, some of that grinding could be fun, as you could gain experience in multiplayer matches or by exploring the patrol zones with other players, but there were plenty of times that it felt like grinding nonetheless. In The Taken King, you level at a pace that keeps you moving through the story, and you can play your way straight through the story without ever having to take a break to spend some time grinding your way through patrols. You'll get about four hours or so of gameplay out of the main story if you're the type who likes to take everything in and explore a little instead of sprinting from one objective to the next, and once through it you'll probably have leveled up to about level 38 and be well within striking distance of the new level cap of 40 (more on this in a bit). The Taken King's story missions also do a better job of telling a story than the original game did. Outside of the game's cutscenes, the story was primarily delivered through exposition by your Ghost AI companion whenever you hit a major mission checkpoint. It was often hard to follow what the Ghost was talking about, and often felt like it was just reading to you from a long wiki entry. It was the kind of thing that would make more sense if you already knew the story before going in. The Taken King thankfully takes a different approach and is far more engaging as a result. There's far more interaction with a number of characters beyond your Ghost, who really takes a secondary role this time around. The interaction is better paced throughout the missions through regular radio messages and communications, rather than being saved up for occasional 'knowledge dumps'. And lastly, and perhaps most importantly, the characters are simply more interesting. The Ghost in Destiny, voiced by Peter Dinklage, was devoid of personality, at times sounding rather bored by it all, as if you were the hundredth player he was talking to that day. In The Taken King, the Hunter Vanguard Cayde-6 (voiced by Nathan Fillion) is your primary point of contact, and his roguish and irreverent attitude is a welcome breath of fresh air into the game. His character is driven to do the right thing, but he's willing to bend the rules a bit to get things done. He is often annoyed by the more serious characters he interacts with, and doesn't hesitate to let them know that. He's the kind of guy that you would actually want to work with if you were a planet-saving hero, and you feel far more motivated to help Cayde-6 put an unconventional plan into motion than you do to help a milquetoast Ghost scan yet another set of archives. 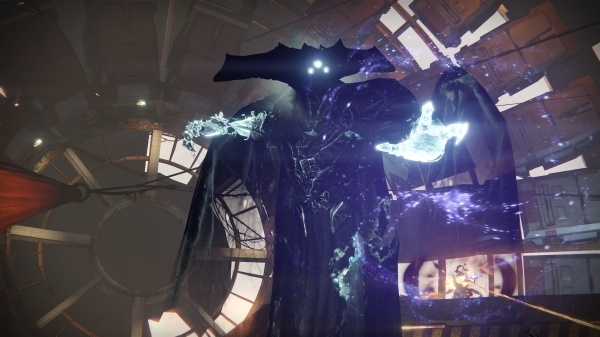 And speaking of that Ghost, its personality also gets an upgrade in The Taken King, which replaces Dinklage with veteran voice actor Nolan North, who provides the Ghost's dialog in The Taken King, and who also rerecorded the Ghost's dialog in its entirety for the original missions as well. It will certainly help to have played through Destiny's original storyline as well as the expansions, but it's not absolutely necessary. Personally, I think it's easier to keep track of what's going on in the Taken King story, even if it's your first exposure to the game, than it is to keep everything straight in the original Destiny story your first time through. As for the story itself, it opens on Phobos, where you're sent to investigate an incident at a Cabal installation. From the outset it becomes clear that something is terribly wrong; as you enter one of the Cabal's ships you see that it is being by torn by rips in the fabric of space-time itself. Making things worse, there is something reaching out from the tears and consuming Cabal troops with darkness. You are witnessing the vanguard of the Taken King's assault on the Solar System, and a precursor to the arrival of his massive and ancient starship, the Dreadnaught. He's come to avenge the death of Crota at the hands of Guardians, unleashing hordes of corrupted Taken from his base aboard the Dreadnaught. But it's not just the story that has been improved; the design of the missions themselves is a marked improvement in The Taken King. Thinking back to Destiny's campaign, the first thing that comes to my mind is the number of missions that followed a similar pattern. Fight your way to a mini boss battle, then fight your way to a spot where your Ghost had to take some time to scan something or other while you fight to survive waves of enemies in what was essentially an abbreviated horde mode battle. There is a much greater variety of missions in The Taken King's story mode, and I don't remember a single one of them following the over worn Destiny mission template. The objectives are far more varied, and make you actually feel like you are accomplishing something. There's a puzzle element to a number of the missions that I just don't remember seeing at all in Destiny. And the marquee battles in The Taken King are actually memorable, especially your ultimate showdown with Oryx himself. The Dreadnaught adds a new location to the game, a massive starship that sits within the hole it has torn in the rings of Saturn. Many of your missions in The Taken King will take place in various locations on this ship, and it also provides the same patrol zone and strike locations that you find on the other worlds within Destiny. It's also a place of secrets, rewarding diligent explorers with secret areas and encounters - although it's easy for players new to the game to focus on patrol missions, completely unaware that such secrets even exist. And it's simply a very cool place, and is unlike any of the other locations in the game. You're in the belly of an enormous and ancient ship, and everything about it looks alien and foreboding. 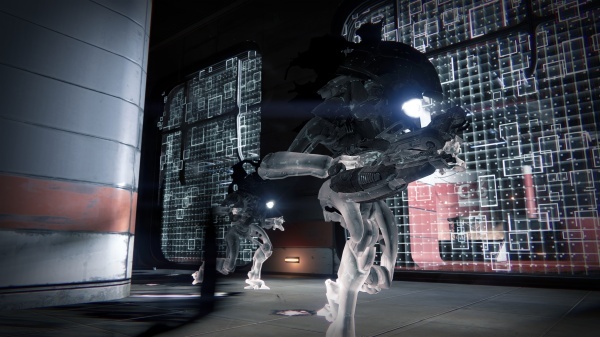 The new enemy faction introduced in this expansion, the Taken, will be at once familiar and alien to Destiny players. 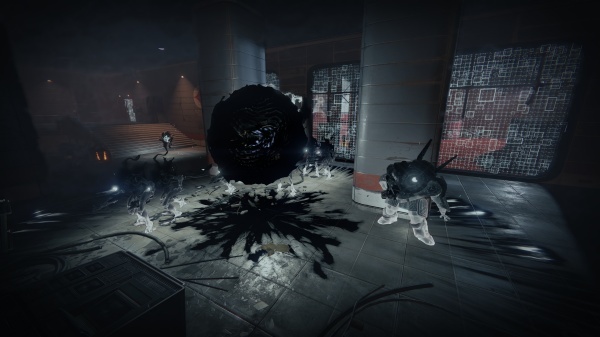 The Taken's ranks are filled with enemies from the other factions, consumed by darkness and given new abilities. Taken Captains unleash spheres of darkness that can envelope you if you get caught in their path, greatly obscuring your vision and completely disorienting you if you're not careful. Taken Psion have an annoying habit of splitting in two, and if you don't take them out quickly enough you can soon find yourself facing a much larger force of them. Taken also have the ability to appear unexpectedly, opening dark rifts in the fabric of space and pouring out of them to attack you. Fighting them is like facing an all-star team of Destiny's enemy factions, and their dark, ghost-like forms give them an additional air of maliciousness. The Taken King's content doesn't end with the story - a new quest system provides multiple-mission quest lines that further expand on the game's story. These new quests are not full-fledged mini story modes - they don't come with the cutscenes and volume of dialog that accompany the main story missions - but they do provide for some compelling missions to pursue once you've completed the story, especially since there are specific rewards to claim once they are completed. Some of the quest lines even include some of the new strike missions, making the strikes a part of an ongoing narrative rather than isolated encounters. The game's bounty system has been streamlined in the Taken King. You'll now be able to work on up to sixteen bounties at once, and their requirements are designed so that they can be met as you are pursuing other goals. Once you complete a bounty, it can be turned in on the spot without the need to return to the game's social hub zone, The Tower. The patrol zone on the Dreadnaught adds a new type of group encounter to the game. While exploring the Dreadnaught you may find special artifacts that can be placed at the foot of certain statues within the ship at the Court of Oryx. Doing so will summon a boss-level enemy, and all players in the area can, and probably should, take part in bringing it down. Four new strikes, challenging missions designed for three players (or one or two determined ones), are added to the game with The Taken King. 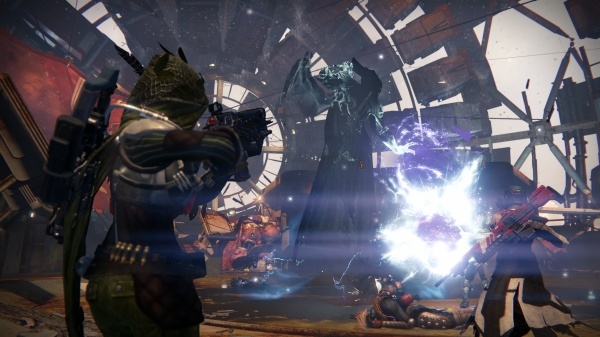 The Shield Brothers has you trying to prevent a Cabal team from detonating the Dreadnaught. The Sunless Cell sends you after a Hive champion deep within the bowls of the Dreadnaught - The Sunless Cell is indeed a very dark place and the champion wields a very big weapon. Fallen S.A.B.E.R. sends you to Earth in response to a plea for help from the defense network AI, Rasputin. The intense final battle in this strike will have you thinking that you have crossed over into a very deadly version of a classic platformer - pattern recognition and split-second timing are essential here. Echo Chamber has you going up against a powerful Vex mind bent on revenge for the destruction of the Nexus on Venus - and it is ready to use both time and space to undo what the Guardians accomplished. All of the new strikes are enjoyable and challenging, and also include some built-in variety in the form of varying encounters and dialog branches, ammo locations, and turret placements. The Taken King has changes in store for your existing characters beyond a new level cap. Light level is split from character level, so character level is now entirely based on experience and not on gear. Gear instead contributes directly to light level based on its total attack and defense values, so even if your character is at the level 40 cap it is possible to grow more powerful by acquiring better gear. Light level is used to determine whether or not your character is strong enough to enter into the game's raid levels. If you have an existing character, then in The Taken King your character's light level will be used to determine its new overall level - the light level will be the new character level - so you may find your character jumping ahead a few levels beyond 30. Each of the three classes gains a new subclass in The Taken King, each of which comes with a new super. 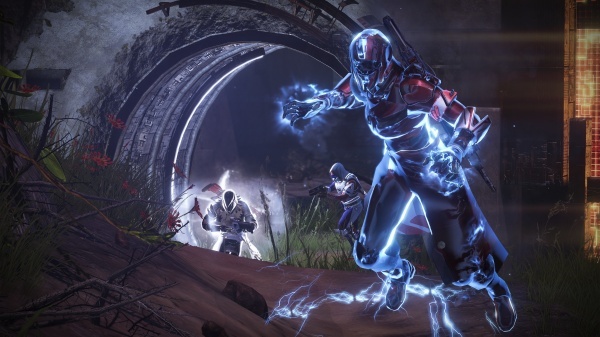 Warlocks gain the Stormcaller subclass, imbuing them with electrically charged powers. 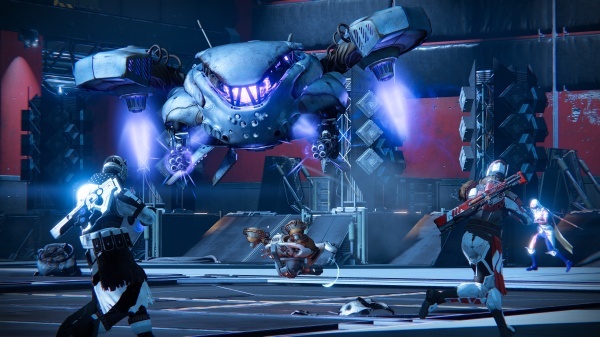 The Stormcaller super is Stormtrance, which gives Warlocks the ability to float above the ground on a cushion of electrical charge while casting bolts of lightning from their fingertips. You even get a third-person view of the action when Stormtrance is active, giving you a great view of the carnage. It's a great crowd-control ability and can be used to rack up the kills in multiplayer if unleashed when the other team bunches up too much. The new Hunter subclass is the Nightstalker, which comes with the Shadowshot super. This is basically a tether which can bind enemies to a spot, preventing them from moving and making them very vulnerable to attack. If you're tethered in a multiplayer match you can still fire your weapons, but you're still basically a sitting duck. Titans are given the Sunbreaker subclass, along with the new Hammer of Sol super. This is a devastating area of effect attack that comes in the form of a flaming hammer thrown to the ground by the Titan. Like the Stormtrance super it provides motivation for keeping a little distance between you and your teammates in multiplayer matches. Each class gets a unique level during the campaign in which you are given your new subclass and work to earn access to your super. It's a great addition to the campaign, as unlocking the previous subclasses were completely uneventful affairs that left you completely devoid of new powers until you earned enough experience playing with the new subclass. Here you get to earn your super while completing a unique mission, and have it available for use immediately after the mission. Multiplayer sees the addition of eight new maps and three new modes: Mayhem, Zone Control, and Rift. The first two are essentially variants, but Rift is an entirely new mode. Mayhem is basically a team deathmatch mode on steroids. The recharge rate for special abilities is significantly increased, respawns are made faster, and special and heavy ammo pickups are more plentiful. Zone Control is a variant of the Control mode that has teams fighting to capture and hold three control zones on the map. The variation in Zone Control is that teams can only earn points by holding the control zones - kills do not contribute to the point total. Rift is entirely new mode that plays like a football mode, that is, capture the flag with a single flag. A Spark is periodically generated at a special point on the map, and once it is players fight to pick it up and carry it to the opposing team's goal, here called a Rift. The Spark must be delivered by leaping into the Rift, with double points awarded for jumping in backwards in what amounts to a reverse dunk. This is an enjoyable mode that is sure to get attract a lot of Destiny players when they move to The Taken King. There's always a lot of action around the Spark generator, and then a mad chase to catch the player carrying the Spark. Patient players can work on their K/D ratio by lying in wait at the Rifts and picking off players focused on the goal. Overall I had a great time with The Taken King. There really is more to it than a new set of story missions and some new strikes and multiplayer modes - it has improved upon Destiny in many of the areas in which I thought that the original game fell short. And, unlike the original, I'm compelled to keep playing the game even though I'm am through with it from a review perspective and have a nice little pile of other games to review at the moment. I've taken all of that into consideration in putting a score on The Taken King, and so you should take that into account when deciding whether or not The Taken King is right for you. At its core, the game is still primarily a multiplayer shooter with an "MMORPG-lite" feel to it, so if that style of gameplay doesn't appeal to you, then The Taken King isn't going to change your mind. However, if you tried Destiny before but gave up on it, I encourage you to return to the game and give The Taken King a chance. And if you're new to Destiny, now is the time to jump into the game because it really has begun to fulfill its destiny. In short, The Taken King turns Destiny into the kind of game it should have been when it launched last year. Final Rating: 88% - The Taken King helps Destiny become the game it was destined to be.